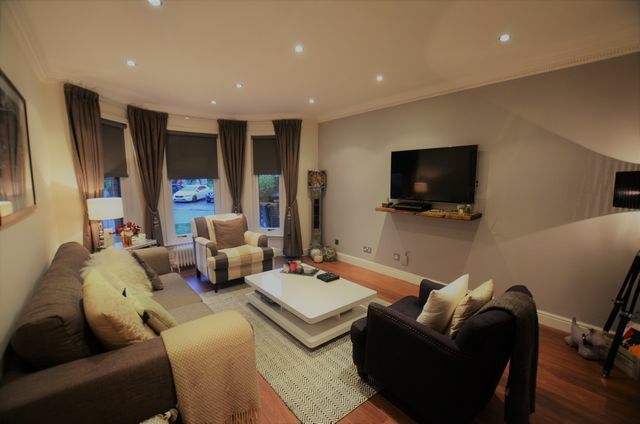 New to the rental market this ground floor apartment is well suited to a professional couple or single person looking to enjoy the bars, restaurants and cafes that Glasgow's vibrant West end has to offer whilst being set back in this secluded, pretty development with residents parking. The property is located on the ground floor ( however there are stairs to access) and comprises entrance hallway with storage, stylish kitchen with integrated appliances, spacious living room with dining area recess, family bathroom with shower over bath and 2 generous bedrooms. The master bedroom which is to the rear of the property, has fitted wardrobe space and an ensuite shower room, and the second bedroom also is to the rear with fitted wardrobes. The property is well decorated throughout with a homely feel. Double glazing throughout and gas central heating. Secure entry. Hughenden Lane is a lovely small development overlooking the sports pitches at Hughenden , with Cafe Parma nearby for a drink, dinner or just a coffee, The Western Tennis Club offering spin classes and gym facilities, and lots of other local shops, cafes etc. Hyndland train station is within 5 minute walk.